While stocks have made new lows commodities have held up well and especially in the past few months. Compared to stocks, commodities have actually hit a new bull market high (relative terms). Take a look at a long-term chart of the CCI/SPX ratio. 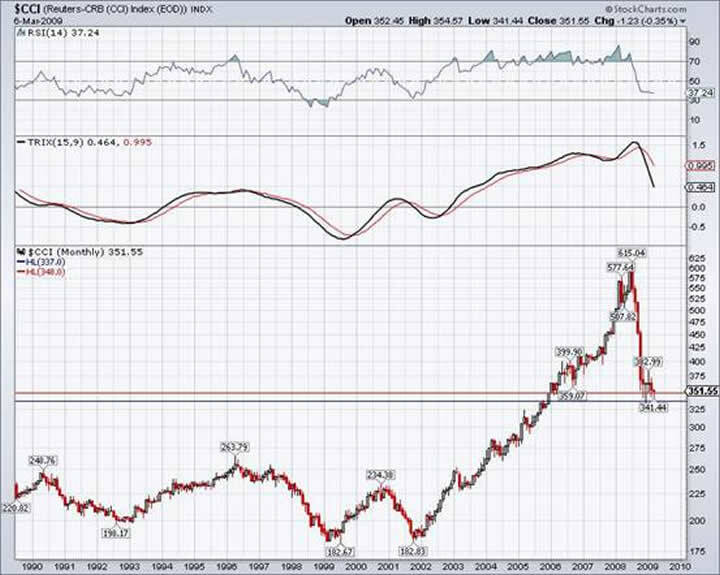 (I prefer to use the CCI, as the CRB is too heavily weighted in Oil). The ratio peaked in July 2008 at 0.49 and bottomed in December 2008 at 0.35. It has rallied all the way to a new high at 0.51. 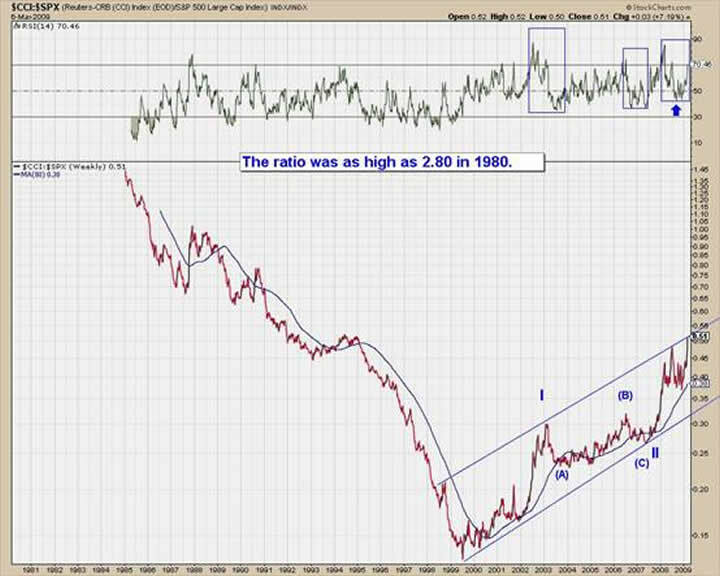 The ratio remains well below its peak in 1980 and from an Elliot Wave standpoint, appears to be early in Wave III. Look for commodities to continue to outperform stocks in the coming months and years. What about commodities in nominal terms? Below is a monthly chart of the aforementioned CCI. During the past five months the market has tried to find a bottom while spending most of its time from 341 to 375. On the chart we highlight two very important support points at 337 and 348. The first (337) marks the high of the previous bull market (in 1980), while the second (348), marks the 62% retracement point of the 2001 to 2008 move. While the market has struggled to find a bottom, it has remained above both levels on a monthly closing basis. Longs should look for a weekly close above 375 to signal at least a medium term bottom. We expect commodities to recover nicely over the next several months, but it is unlikely that this is the final bottom in terms of time. One market to keep an eye on with respect to commodities is the US Dollar. There have been so many calls for a top in the dollar that I've lost track. One thing is certain. Tops usually take longer to form than bottoms. The dollar isn't just going to start falling precipitously. 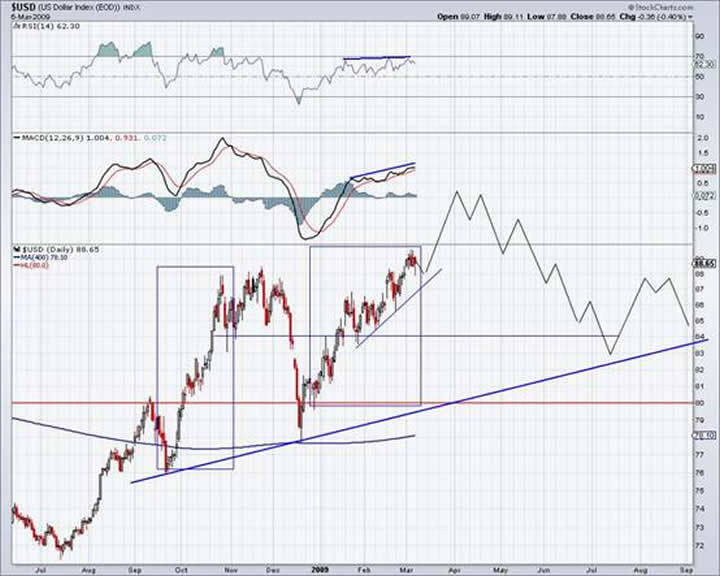 First it has to break its uptrend and then it has to confirm a breakdown through 80 on the dollar index. Keep in mind that a renewed bear market in the dollar necessitates a renewed bull market in the Euro and foreign currencies. Speaking of the dollar index, we see the potential development of a head and shoulders pattern. The current rally looks to be forming the head of the pattern. In any event we don't see the dollar breaking down until near the end of the year at the earliest. We note the possibility for marginal gains in the very short term, but the medium term uptrend is exhausting itself and this will help fuel a recovery in commodities and commodity shares. Which two commodities do we think are buys right now? That information is for subscribers only. Visit our website to sign up for our either our free or premium newsletter. Good Luck! Trendsman” is an affiliate member of the Market Technicians Association (MTA) and is enrolled in their CMT Program, which certifies professionals in the field of technical analysis. He will be taking the final exam in Spring 07. Trendsman focuses on technical analysis but analyzes fundamentals and investor psychology in tandem with the charts. He credits his success to an immense love of the markets and an insatiable thirst for knowledge and profits.